There Is A HOT New Hair Stylist In Town!! 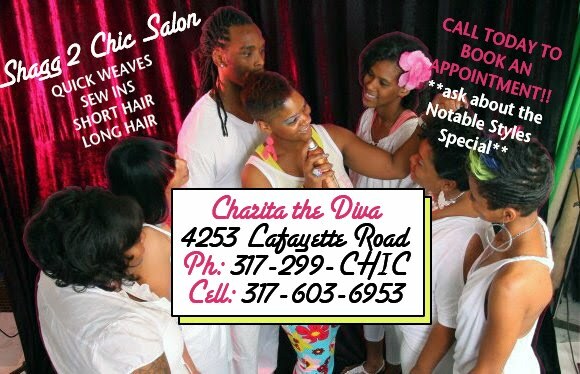 Charita the Diva, is a creative and professional hair stylist that has the ability to style just about any hairstyle that you can imagine. I have personally seen her transform peoples hair into some beautiful hairstyles. She does natural hair locs, virgin hair presses, quick weaves, sew ins, roller wraps, soft cuts, razor cuts and more. Charita is definitely a force to be reckoned with in the salon and hairstyling industry. Call Charita at the salon telephone number of 317-299-CHIC and book an appointment with her, today! Click here or the ad along the side bar of the blog to connect with Charita via facebook. Accent Your All White With Louis Vuitton! The Dream "Love King" Album Review Submissions! Wear A Black Shoe With Your All-White! NaNa at the Lil Miss Diva Quarterfinals!! Dereon Has A Special Invitation For You! The New Calf Hair Loubies!!! Jay-Z and Eminem Home & Home Tour Dates!! Under Pressure - Dr. Dre and JayZ is Released!! View of Yogis at The Standard in Miami!! My Favorite Pre-Fall Herve Leger Dress!! *New Music* Roots - iTunes Buy!! 100 Acres at IMA Opens Tomorrow!! Jeezy Jams Which One Is The Summer Anthem? Megan Fox for Armani Underwear!! Another 1 From OPI Nail Polish!! *New Music* JayZ and Dr Dre!! Submit Reviews For Drake's Thank Me Later Album! Jump Shoes - From A Notable Styles Subscriber!! Recap of an Essence.com Article! Hot Shoes, For The Cool!! Lauryn Hill Will Rock The Bells!! *New Music* Trey Songz Already! Help from the SBA on Acquiring Business!! Notable Tip of the Day! Song Riddle of the Day! Miami Nights! Maxines Chicken & Waffles Adding More Culture! Chanel Classic Flap Alligator Bag!! Murphy Lee in Indy Tooooonight! T.I. New Vid Yeah U Know! Get Back To Eating Right After The Holidays! !